All Seasons Termite & Pest Control - MOSQUITO CONTROL Mosquito Control System55 or 30 gallon poly reservoirUser friendly automatic timer combines the ultimate in reliability and ease of useCan be activated at any time by remoteStainless steel and brass nozzle has a built in check-valve that shuts off to eliminate dripping Positive displacement pumps provide quiet, reliable serviceFloat assembly inside reservoir automatically shuts system down when the reservoir is low. Professional InstallationWe custom design each system according to the needs of our customers for year round protection from mosquitoes.High quality precision nozzles are strategically placed around the perimeter of the areas to be treated.The Mosquito Control System automatically releases a fine mist at predetermined times to eliminate mosquitoes.Best of all, our licensed pest control technicians can adjust and refill the system on a regular basis. Let your kids enjoy the backyard playground; invite friends over for a family BBQ; even enjoy your swimming pool without worrying about those pesky mosquitoes. Float assembly inside reservoir automatically shuts system down when the reservoir is low. We custom design each system according to the needs of our customers for year round protection from mosquitoes. High quality precision nozzles are strategically placed around the perimeter of the areas to be treated. 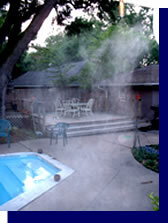 The Mosquito Control System automatically releases a fine mist at predetermined times to eliminate mosquitoes. Best of all, our licensed pest control technicians can adjust and refill the system on a regular basis. Let your kids enjoy the backyard playground; invite friends over for a family BBQ; even enjoy your swimming pool without worrying about those pesky mosquitoes. Mosquito Control Systems have proven to be extremely reliable and effective for nearly 20 years in many industries. They have been used in kennels, cattle and dairy barns, horse stables and poultry operations to control mosquitoes, flies and other insects. All Seasons Termite & Pest Control is now making these high quality systems available to our customers! As a licensed pest control company, we will use pyrethrum or pyrethrum based products, depending on the customer preference. Pyrethrum is derived from the chrysanthemum flower. It is approved by the EPA and non-toxic to people and pets. All product labels and MSDS sheets are available if desired. Because of budget restraints, many cities have cut back on mosquito fogging and now only fog when absolutely necessary or when there is an immediate health danger. Almost everyone has had the unpleasant experience of being bitten by a mosquito. Mosquito bites can cause severe skin irritation through an allergic reaction to the mosquito's saliva, this is what causes the red bump and itching. But a more serious consequence of some mosquito bites may be the transmission of certain diseases such as West Nile Virus, Malaria, Dengue Fever, and several forms of Encephalitis. Not only can mosquitoes carry diseases which afflict humans, they also can transmit several diseases and parasites that dogs and horses are very susceptible to, such as dog heart worms and Eastern Equine Encephalitis.